Each fall, as part of the annual National Pro Bono Celebration, the Washington Council of Lawyers and others organize DC Pro Bono Week. This year, DC Pro Bono Week 2018 takes place from October 21–27 and offers many opportunities to do pro bono work, learn new pro bono skills, meet other pro bono lawyers, and expand your pro bono horizons. A full schedule of events is listed on the DC Pro Bono Week webpage. In addition, there is a host of affiliated trainings scheduled throughout the fall that will help get you ready to take on a pro bono project. 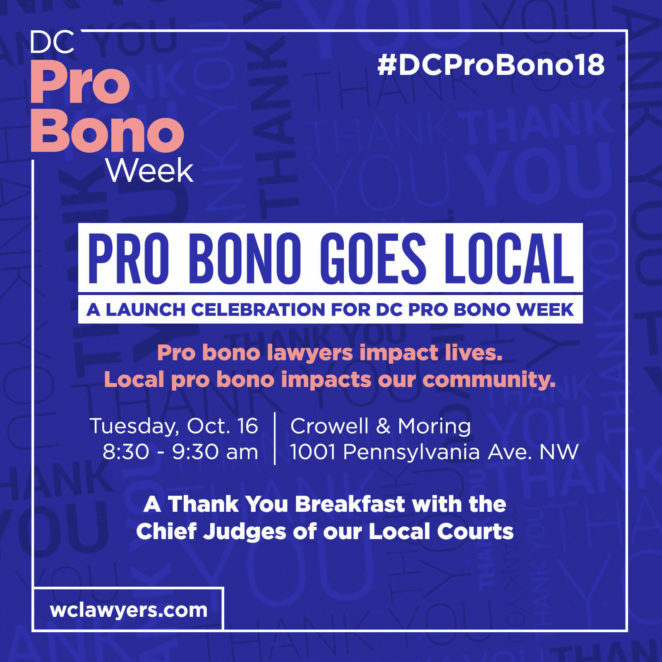 This year, we invite you to help kick-off DC Pro Bono Week by joining the Chief Judges of the D.C. Courts and others at a very special celebration, Pro Bono Goes Local, on October 16, 2018, from 8:30-9:30 a.m. at the law firm of Crowell & Moring, 1001, Pennsylvania Avenue, NW. This kick-off event will celebrate pro bono attorneys for their service, highlight the ongoing need for pro bono representation in our local courts, and welcome those who want to learn more about how to expand access to justice for those in our community who cannot afford counsel. All are welcome, so please spread the word, grab a colleague or two, and join our Chief Judges for a light breakfast, a hearty “thank you,” and an opportunity to get involved in local pro bono! Here at Legal Aid, we have a lot to celebrate! Our robust Pro Bono Program is as busy as ever. Last year, Legal Aid pro bono volunteers provided a record-breaking 38,700 hours of service – valued at over $22.9 million – to make justice real for low-income individuals and families in our community. And, with your help, we are hoping to break that record in 2018! During Pro Bono Week and every week of the year, we celebrate all of our dedicated pro bono volunteers throughout the city who contribute significant time and talent to helping our client community secure access to justice! For more information about Legal Aid’s Pro Bono Program and how to get involved, contact Jodi Feldman at jfeldman@legalaiddc.org, or Sylvia Soltis at ssoltis@legalaiddc.org.